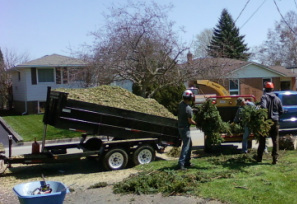 A by-product of chipping up brush is mulch and yes we do sell mulch by the trailer load. The average load equals 10 yards and in most cases can be delivered for $50. If you would like to be put on our list please call but be warned that we are not in the mulch business so it can only be sold when it is on hand and the type of mulch varies from job to job. Discounts for multiple loads can be negotiated.